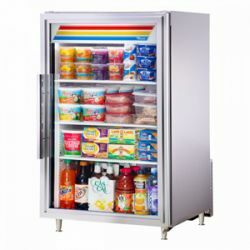 Everest Refrigeration EMGR10 24" Single Swing Glass Door Merchandiser Refrigerator - 10 Cu. Ft. True GDM-19T-HC~TSL01 27" Black Glass Door Merchandiser with LED Lighting - 19 Cu. Ft. Merchandising Refrigerators entire purpose is to increase impulse purchases by customers. They are designed as display refrigerators, typically with either glass doors or an open front so that you can present your food items in the best way in order to entice customers. Other merchandising units such as milk coolers provide quick easy access to products so the customer can grab their item and go. 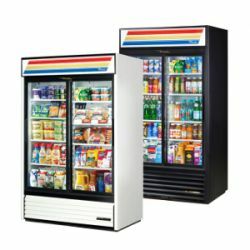 Available as large, upright floor models as well as countertop refrigerators with smaller footprints that can be placed close to points of purchase. Open air merchandisers allow customers to get the items they want without ever needing to open a door, so there is no barrier to increasing your sales. Merchandising Refrigerators are designed to increase impulse purchases by customers. They are essential display refrigerators, typically with either glass doors or an open front so that you can present your food items in the best way in order to entice customers. Merchandising refrigeration includes upright reach-in models, countertop units, milk coolers, and air curtain merchandisers. Milk coolers provide quick easy access to products so the customer can grab their beverage carton and go. 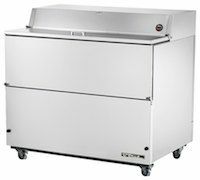 Upright floor models as well as countertop refrigerators with smaller footprints can be placed close to points of purchase in front-of-house applications. Open air merchandisers allow customers to get the items they want without ever needing to open a door, so there is no barrier to increasing your sales. 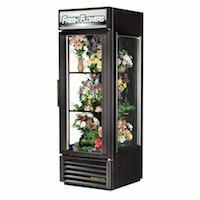 Consider one of these merchandising refrigerators to meet the needs of your foodservice establishment.